As we all know, UPTET December 2016 has been successfully completed all across the STATE of Uttar Pradesh. This time (Dec 2016 UPTET) approximately 7.60 Lakh candidates has appeared in the Exam and now waiting for the positive result in favour of them. Although, the official answer keys will be published by UPBEB (Uttar Pradesh Basic Education Board) any day after 27th December, 2016. To reduce the butterflies in the stomach, each and every UPTET candidate is searching for any reliable source of the UPTET Dec 2016 answer keys. Using the UPTET answer keys, anybody can have a rough idea for their coming UPTET result. To confirm the result, you always have to wait for the Official UPTET result declaration, which will be anytime in the month of January 2017. So without wasting any more nervous time of the UPTET candidates, below is the UPTET December 2016 Original Question Paper (SET Y) with complete solutions / answer keys / answer sheets. Unofficial Answer Sheets for UPTET has been prepared by the reputed / renowned qualified teachers with bulk of teaching experience in their respective field. UPTET 2016 UPRI Question Paper 2 (Class 6 to 8). Who can USE this UPTET Dec 2016 Solved Question Paper with Answer Keys. Candidates waiting for the results can use the answer keys to decrease the butterflies in their stomach and increase the self belief. Institutes / Organisations involved in the UPTET Preparation Education. Students can use this Fully Solved UPTET 2016 Exam paper as UPTET Study Material once they decide to attempt for the UPTET Examination in the coming years. Download Original UPTET 19-December 2016 Paper-2 (Upper Primary Level) SET Y Question Paper with Solutions / Answer key. UPTET 19 December 2016 Question Paper consist of total 32 pages, it has been divided into 4 Sections which are given below. Please do read all the instructions carefully while attempting for the Uttar Pradesh Teacher Eligibility Test Exam. Sections of the UPTET Upper Primary (UPRI-2016) Level Exam. Section 2: Language – 1, Hindi / भाषा – 1, हिन्दी. Section 3 (A): Language – 2, English / भाषा – 2, अंग्रेजी. Section 3 (B): Language – Urdu / भाषा – उर्दू. 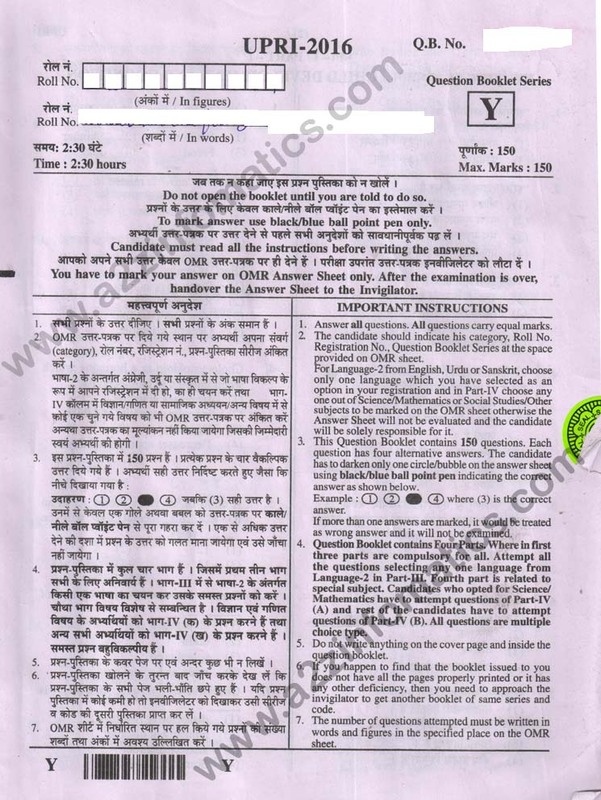 Section 3 (C): Language – 2, Sanskrit / भाषा – 2, संस्कृत. Download Original UPTET 19-December 2016 Paper-1 (Primary Level) SET P PRI-2016 Question Paper with Solutions / Answer key. Download UPTET Dec 2016 Official Answer Keys for all Sets of Paper-1 & Paper-2 (Released on 28-12-2016 at Official UPTET Website).